It’s been a while since I posted about World of Warcraft, so I decided to showcase some of my screenshots in today’s blog post. My biggest recent accomplishment was actually getting the Glory of the Icecrown Raider (25-player) a­chieve­ment. I’ve been wanting to finish this for over a year, ever since I first started playing World of War­craft. Back in Mists of Pandaria, I had some friends who were veterans of World of Warcraft carry me through the final Wrath of the Lich King raid. We sort of made some progress here and there, but I was dis­ap­pointed at how little they actually knew about the game, and we ended up not getting me the a­chieve­ment. As the saying goes, if you want something done right, you have to do it yourself. Over the span of two weeks’ worth of instance resets, I managed to solo the Glory of the Icecrown Raider achievement with Sha­dow Priest. After returning to my Garrison, I hopped on my new dragon mount and took a screenshot in front of my Town Hall. I also went to an area of Talador where your character becomes translucent white, and took a screenshot of the mount there as well. I also finally made enough progress through the storyline to unlock the Shipyard in my Garrison. 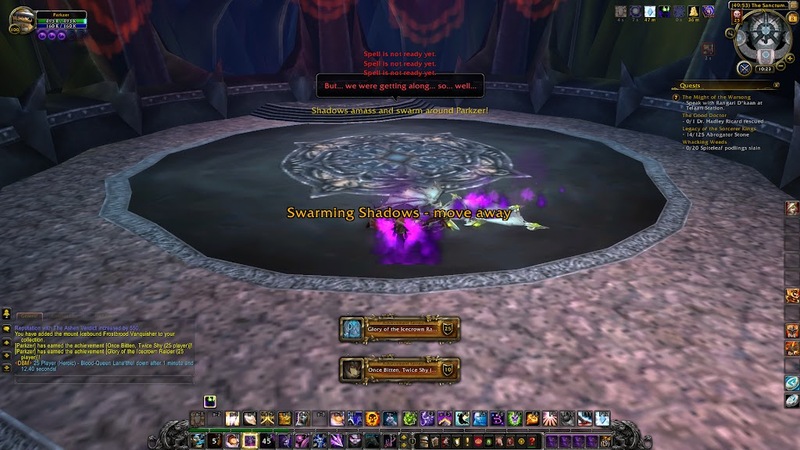 And finally, last week’s special event was doing dungeons on mythic difficulty. I actually had never done mythic dungeons before, because it takes a lot more effort to find a group (when you can just easily queue up for heroic dungeons in the instance finder). After spending a lot of time searching for groups (which was difficult because my item level is only 700), I finally finished 4 mythic dungeons. The timing of my return to World of Warcraft: Warlords of Draenor was pretty lucky, because a new patch with new content just got released. I have a stream VOD of gameplay from today of completing instances for Valor Points and new bat­tle­ground gear, as well as a VOD from yesterday, when I played for a few hours before going to sleep. 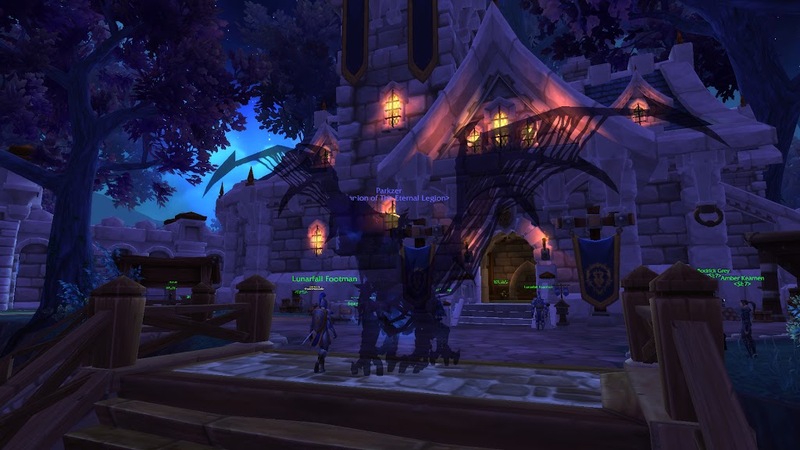 I like that World of Warcraft is cycling through older content to encourage newer players to ex­pe­ri­ence it. Especially with Level 100 character boosts coming out, some people won’t be able to go through the classic leveling process, and will instead just choose to jump to the level cap. Even for the people who do level up regularly, they will most likely be using heirloom gear, so the amount of experience gain from dungeons will be massively increased, and they’ll only do a few dungeons from each expansion before moving on to the next one. Back when I was an undergraduate in university, I played quite a bit of TERA, and one thing I hated was the lack of replayability during the end game. You couldn’t go back to redo old dungeons, so you were stuck just grinding the same three to five end-game dungeons to farm up your gear. I like that World of Warcraft isn’t falling into this same trap, and they are taking the initiative to increase the diversity of available playable content. Something I really dislike about some MMOs is how your gear becomes useless after a new patch or expansion is released. I like keeping my old gear and adding onto it with upgrades and features, rather than just getting an entirely new piece of gear. Although Valor upgrades aren’t going to keep my gear completely relevant forever, it at least makes me feel like I’m working towards unlocking better gear through improving my current gear, rather than just grinding for new pieces. The way that Valor is awarded also encourages players to diversify their played content. Valor Points are generally only available for the first completion of the day on various different tasks, which makes sure that players are mixing things up, instead of just getting bored repeating one thing over and over. This sort of branches off Valor upgrades, in that, I don’t like how PvP gear becomes completely in­ferior when a new season begins. I would rather prefer to see a way to upgrade Season 2 gear into Season 3 gear at a slightly reduced cost than just buying Season 3 gear from scratch. The way that it is now, it’s as if all the time spent getting the best Season 2 gear was wasted from a long-term perspective. Either way, lucky for me, I barely had any Season 2 PvP gear anyway (seeing as I just started play­ing WoW again about a week ago), so I’ll be playing some battlegrounds and working towards getting a full set of PvP gear on top of PvE gear. 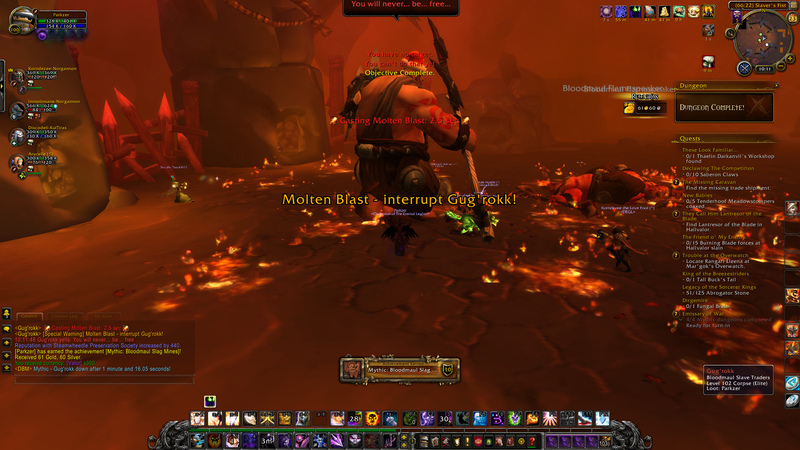 I started playing World of Warcraft during the Mists of Pandaria expansion back in March of 2014. I con­tinued playing until May, at which point I felt as if I got the fundamentals of World of Warcraft down, and took a break. The main reason I played back then was to understand the basics of what World of Warcraft was about. Over a year later, during June of 2015, I redeemed a free seven-day subscription voucher that I received from Blizzard. 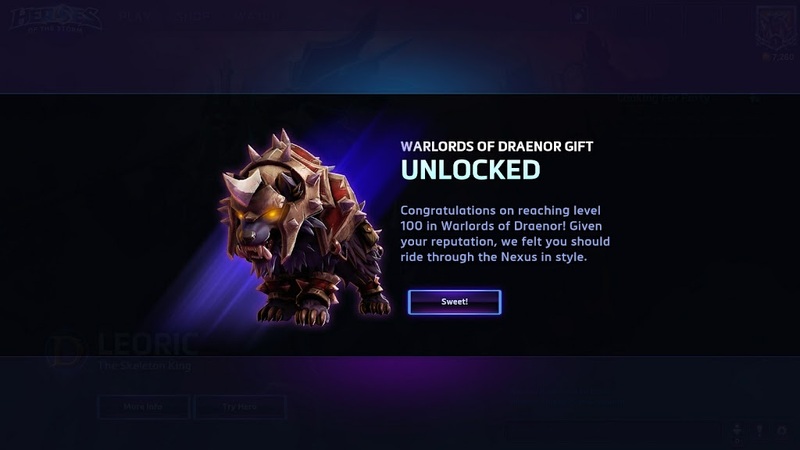 My main motivator for redeeming the voucher and playing again was to get to Level 100, the new level cap, so I could earn a mount in Heroes of the Storm in a cross-game promotion. Unfortunately, during that seven-day period, I fell short and ended up running out of time at Level 94. About a month and a half later, Blizzard offered me another voucher, which I redeemed for a second week of free game time. 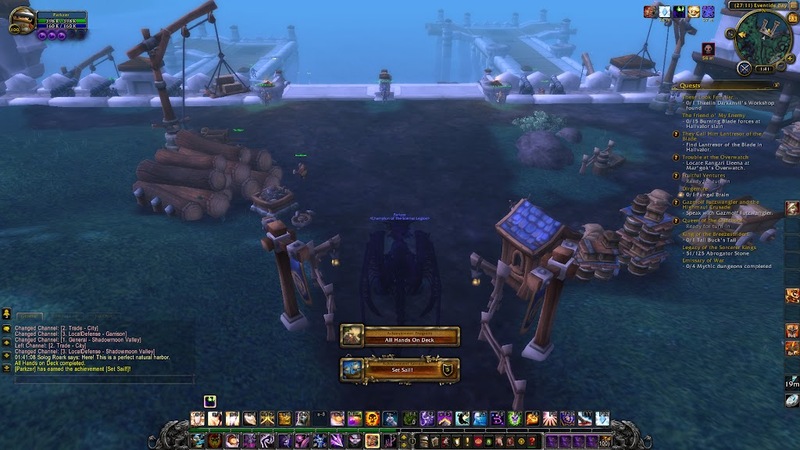 That time, I was determined to reach my goal of Level 100, and I succeeded – I leveled my Shadow Priest to 100, and earned my mount in Heroes of the Storm. Since then, I barely even thought much about World of Warcraft until four months later, in November, when I randomly pre-ordered the new upcoming World of Warcraft expansion, Legion. I made a blog post on the sixth of this month sharing my pre-order and wondering how Blizzard’s marketing managed to get me to get a game that I barely play. Now that I am the somewhat proud owner of Legion, I decided that I might as well play World of Warcraft again for a month to get back into it for a little bit and prepare myself for the expansion. So, I picked up a one-month subscription and signed back in. To get used to the controls again, I made a new character – a Blood Elf Warlock on the Hyjal server. I set up my system and interface settings, organized my action bars, and started getting into the rhythm of World of Warcraft again. I also got a glimpse at what a Horde character is like. This screenshot is of a few achievements I earned after hitting Level 20; I ended up continuing to level until I reached 24. Afterwards, I went back on my Shadow Priest and transferred to a PvE server. I was originally on a PvP server because the person with whom I originally played misadvised me and failed to tell me how dumb open-world PvP was. I decided that now was the time to move on to a normal server, and switched over to Lightbringer. I still had all my heirloom leveling gear on my Shadow Priest, but that didn’t stop me from jumping straight into end-game content. With an item level just barely high enough to queue up for heroic dun­geons and basic raids, I started completing content. It took a long time to reach Level 100 because I felt pressured at the time, as if it was a grind and a race to Level 100 just to get the mount. But, now that I have no goal to be an external motivator, I’m focusing more on enjoying the game, and it’s a lot more fun than what I had originally thought. The biggest problem with the map system being poor still exists, but it’s not as salient to me anymore because I’m spending most of my time in instances and questing on Draenor. If I do end up finishing all the Draenor content and wanting to go back to farm achievements, then I’ll probably get frustrated at the map again. But, for now, it’s bearable. Overall, from the first few days of playing World of Warcraft again, I’m glad that I decided to play for a month, and the experience so far has been enjoyable. I’m hoping that this lasts long-term, through the entire month, so I can get the most out of my subscription time. I don’t really even play World of Warcraft. I first played for a bit back during the Mists of Pandaria expansion, and I pre-purchased Warlords of Drae­nor at the time. I played a bit of WoD when Blizzard offered me seven free days of game time, and I leveled my character up to the new level cap. 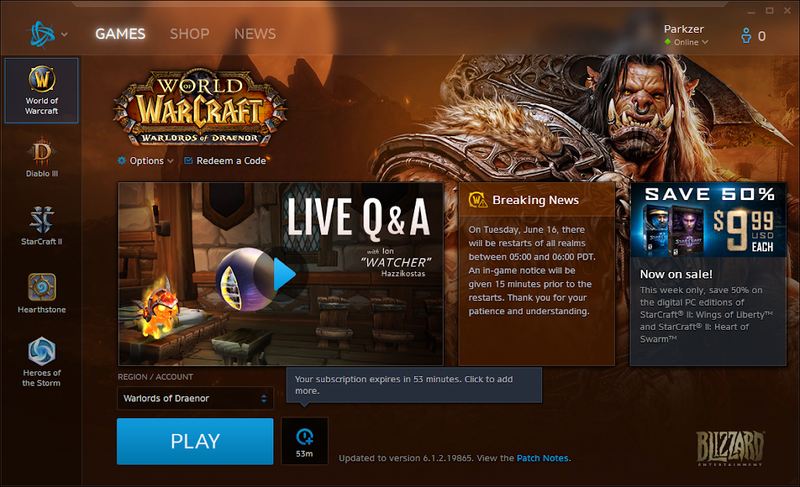 Other than that, I don’t ever get on World of Warcraft, because I never maintain an active subscription any­more. But there was just something about Legion. 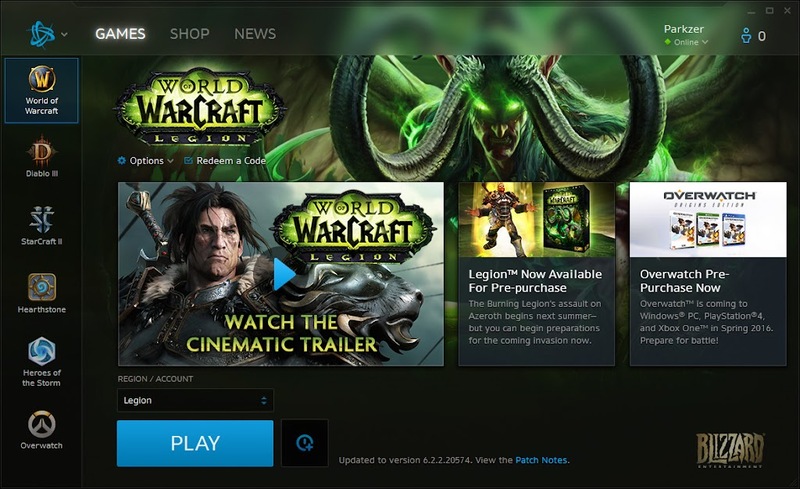 I am now the confused owner of World of Warcraft: Legion, digital deluxe edition. 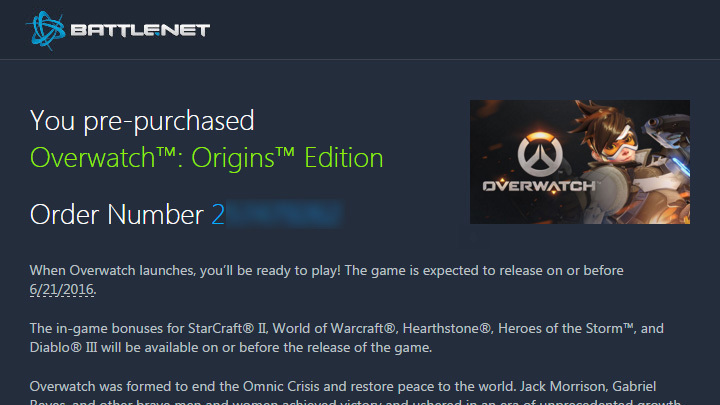 Suddenly, I now own Overwatch: Origins too. At least I’m a little less confused about this one, seeing as I’m eventually going to need the game to ef­fec­tive­ly get work done for Tempo Storm Overwatch. Still no clue why I got myself Legion, though. The second time’s a charm. After four more hours of gameplay and grinding a lot faster than anticipated, I made it from level 96 to level 100 in the past few days. I’m nowhere near completing the actual content of the expansion, but I still reached my goal of hitting Level 100 before my seven-day free subscription ran out. It was actually remarkably close, as I finished with only about two hours to spare. In the first stream session, I realize that the dungeon quests help me out quite a bit in terms of leveling efficiency. I also skipped the remainder of the area I was originally at, and moved on to a different area better fit for my level. I ended up getting over 20,000 experience for each quest, and that helped me level astronomically quickly. The second stream session starts when I’m level 99, which means I did do a little bit of leveling off stream in between the two days. The second stream was broadcasted from my martial arts academy, which is why you hear a lot of back­ground noise. The staff at the academy were watching a TV show of some sort before classes began, which is why it’s very dark for a majority of the stream. This does mean that I finally got my mount in Heroes of the Storm. As I’ve most likely mentioned before, I’m probably never going to use this mount unless there is a new hero or skin released that matches well with its style. Regardless, I like having large collections of things, and this wolf is one more thing to add to it. As I teased at the end of my blog post on the 23rd, Blizzard sent me another gift of seven days of game time in order to try out the new content from Patch 6.2. Unfortunately, the last time they did this, I did not manage to finish leveling up to 100, so it’s likely that I won’t really be experiencing much of the new content within these seven days. However, this does mean that I get a second opportunity to reach the level cap. My two primary motivations for doing this are experience and a Heroes of the Storm mount. As a gamer and content advisor, it’s helpful to have as wide a range of experiences as possible. Leveling a character to 100 is one of the valuable experiences, even if I don’t advise World of Warcraft content creators, because it’s a classic game that’s been around for a long time, made by a very large and reputable game developer. As for the mount, sure, I already have a ton of mounts and I will most likely not use some random wolf mount that I get, but I love the fact that Blizzard integrates all of their games together, and I’m eager to add the mount to my collection simply for the sake of collecting it. I got to work two days ago, spending a large chunk of time before (and during the beginning portion of) the stream session getting re-accustomed to World of Warcraft. In the second stream session, I discover that battlegrounds no longer give experience (or at least, not if you lose them). Although that was a bit of wasted time, I made up for it by learning part-way through the stream that I need to build an Inn at my Garrison in order to receive dungeon quests and speed up my leveling. In these five hours of gameplay, I managed to go up from level 94 to three-quarters of the way through 96. If I remember correctly, the last time I played World of Warcraft, I found out that it takes approximately two hours for each level. So, at that rate, I shouldn’t really be spending any more than six or seven hours to finish my leveling journey. Yes, that screenshot does indeed show that I have 53 minutes remaining of my seven days of free game time. Unfortunately, this past weekend, I ended up getting occupied with a bunch of other stuff, and managed to add in a grand total of zero hours of gameplay since my last World of Warcraft stream. Yes, I do want the mount in Heroes of the Storm that you get for reaching Level 100, but I guess I sub­lim­inally don’t want it so badly that I drop everything and play World of Warcraft for over 15 hours across two days. I’m sure I’ll eventually resubscribe for one month to finish what I started (or maybe Blizzard will be kind enough to gift me with another week of game time again if I don’t play for long enough). Back in March 2014, I started playing World of Warcraft. It’s a pretty big game, and I decided that it’s historical enough that I should probably at least try it out. At first, it was pretty overwhelming because there was so much content that I wanted to do that has been piling up since the game first came out over a decade ago. It managed to keep my attention for about three months before I decided to store it away for a while and move on to a different game again. Back during that time, I preordered Warlords of Draenor. The expansion came out late last year, but I hadn’t played since then. It seems like Blizzard noticed how inactive my account was, and sent me an email offering me seven free days of game time. Seeing as I had an entire expansion already purchased and waiting for me on my account, I decided it would be a good idea to capitalize on this promotion. A little bonus on top of the free game time is that, if I manage to hit the new level cap of 100 during my free week, I can also get a mount in Heroes of the Storm. If you’ve been following me at all for the past few weeks, you know that I very much enjoy Heroes of the Storm and I played it nearly obsessively for quite some time. Apparently some guy leveled from 90 to 100 in 11 hours back when it came out on the public test realm; I’m obviously not going to get my leveling done that fast. It seems like I’m going at a rate of about two hours per level, so in that case, I should be done in about 16 more hours of gameplay. In an ideal world, I’ll be able to play three hours every day for the rest of my trial period, but I have a feeling that it might not end up like that. Regardless, I’m going to try and get as much as I can out of my seven days, and if I discover that Warlords of Draenor is a huge improvement from Mists of Pandaria and I want to keep playing, I might even resubscribe for another month to continue enjoying the new expansion.